Home Debt What is Good Debt? It might seem a bit confusing to hear about debt in terms of good or bad. There are certain debts that are good to have. You may want to buy a home and it's accepted that most people will have debt when making this purchase. The more important thing is to keep up on debt and make sure that your payment history stays healthy. 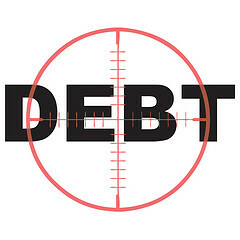 Avoid collecting unnecessary debt as it can weigh on your finances. It can drag you down and make it impossible to keep your payments up on what is considered good debt. Since we all know what bad debt is, let’s talk about what good debt is. The purchase of a home will certainly put you in debt, but it's considered good. Real estate holds value, no matter how bad the economy seems. When prices go down, simply hold on to your property until the prices go back up. When initially applying for your mortgage, be sure you've gotten the best interest rate possible. Afterwards, you are set to simply keep up the payments and keep your finance history positive. Be careful, not to fall into the money pit of taking additional monies on a refinance of the mortgage for the purpose of paying off credit card debt. That would be an example of trading good debt for bad. A car is a necessity for many households, especially if you live in an area that has no public transportation services. It's considered good debt if it isn't one that is well beyond its expected life span, which can mean future repairs, or too expensive to meet your budget. This is why everyone isn’t able to afford to drive a luxury or sports car. Look at purchasing one for functionality and fuel economy. A sensible auto purchase is adding good debt. Although many say that a vehicle is a depreciating asset, which it can be – it really comes down to use. Getting a college education will assist you in earning a higher level of income. Although student loans can seem like a debt that could follow you around for a long time, it is actually good debt. The benefits of the education far outweigh the repayment terms. To make the best use of this financial support, only borrow what you need. This will limit the amount you have to pay back and will help you to pay it off quickly. Make sure that when you choose your degree field, you go into a career field where you can make a good living and pay off your student loans. You need to make sure that you develop a good workable budget and stick to it. This means that your total debt should be kept to a minimum. Adding good debt is fine, but you don't want to add so much that you end up not being able to make a little more than the minimum payments on everything. The best way to avoid a negative credit rating is to curb unnecessary spending of any sort, good or bad. If an emergency arises which requires money, applying for the lowest interest rate and flexible terms makes the most sense. However, what if you don’t qualify for the best loan? Look at non-profits and government programs which may offer some type of loan assistance, there are generally great programs available for low income earners or those on welfare. Credit cards and store charge accounts are where many people end up getting into huge debt that they can't afford. Furniture, if it's high quality, can be a good thing to buy, but you need to make sure that you can afford it. Will the monthly payments get in the way of other responsibilities? Purchasing food and clothes should never be done with a charge account. These are basically disposable items and if you do buy them on credit, pay the bill in full every month. Disposable purchases should never be put on a high interest credit card. Search until you find one that offers reasonable rates. Work hard at paying down debt during the year so that you won't feel guilty around holiday shopping. Although there is good debt, you owe it to yourself to spend your money and use credit wisely. The best debt of all is no debt. Remember that when you feel like you want to purchase something that is more of a want than a need. By following the guidelines above, you can enjoy your life without the regret of financial hardship later.